– Subscribe to our mailing list, we’ll notify you when we publish transcripts like the one below. Former chief of staff to Ret. Gen. Colin Powell, Lawrence Wilkerson, said that his country is “sitting with the devil” by working with Saudi Arabia, referring to the Riyadh as “the greatest state sponsor of terrorism in the world”. 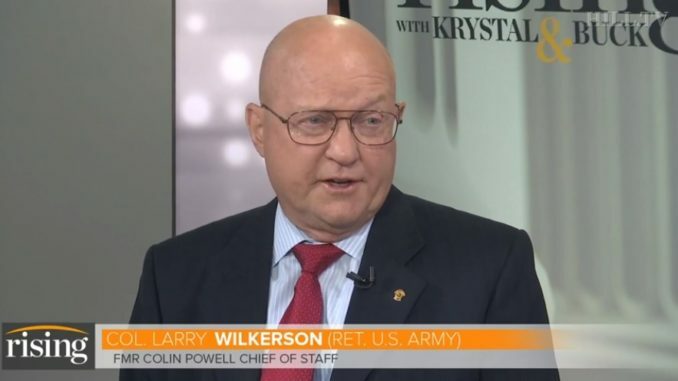 Wilkerson made those comments during a show on ‘The Hill’, a top US political news outlet based in Washington D.C..
As you said earlier, there’s no shortage of chaos in the area, and the Iranians are behind a good portion of it right now. With the Houthis in Yemen, we’re seeing the civil war continue to grind on there, the possibility of millions of people being pushed into starvation if the blockade finally cuts off the last major port for the entry of food into that country. Yemen is a place where there is a very active Al-Qaeda contingent aswell, there’s clear US national security interests, we’ve been involved in trying to deal with that for many years. Do you think that the administration is taking the right course by being mostly hands off in Yemen? Do we have a humanitarian obligation to do more in Yemen, what would be your counsel? I wish we were mostly hands off in Yemen, in fact I wish and have been advocating for – on the (Capital) Hill and the Senate and the House – declaring the war unconstitutional vis-à-vis the United States and getting us out entirely. What we’ve done is made a choice, we’ve sided with the boy-king anointed Mohammed bin Salman in Riyadh, in Saudi Arabia, and his mentor in the Emirates, and we’ve said okay, we’re in for everything. In other words, we’re in for this humanitarian disaster. We’re providing intelligence, we’re providing help on the ground, as the New York Times recently revealed, we’re providing fuelling for the bombers and fighters that are attacking the ground targets in Yemen. It is a huge humanitarian disaster. We have no business being there. It is all Saudi Arabia and the UAE. But Donald Trump has apparently made a decision to sit with the devil. You can say that there are two devils, Tehran and Riyadh, but look what Tehran supports for example in the realm of terrorism: Hezbollah and Hamas. Both are arrayed against Israel, not against any global targets or against the United States. What does Saudi Arabia support and what is Saudi Arabia doing right now in Yemen with ‘Al-Qaeda in the Arabian Peninsula in Yemen’ (AQAP), probably the most strongest and most capable element of Al-Qaeda in the world? Al-Zawahiri is probably there or close by. They’re helping them. They’re leaving them with their arms, they’re paying them…any time Al-Qaeda will help Saudi Arabia against the Houthi rebels, Al-Qaeda is welcomed into Saudi arms. Remember, 15 of the 9/11 hijackers were Saudi, (Osama) bin Laden was a Saudi contractor, so we’re allied with the devil right now, against a lesser devil. They are the greatest state sponsor of terrorism in the world.